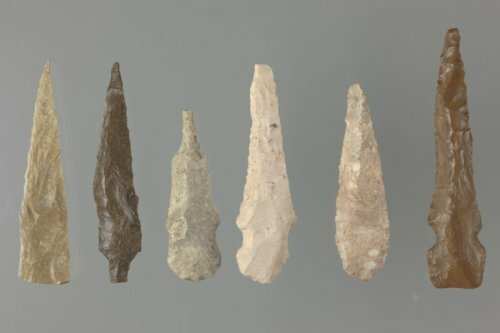 These drills or perforators were recovered from excavations during the 1977 and 1978 Kansas Archeology Training Program field schools at the Tobias site in Rice County. Drills were used to bore holes in materials softer than the drill itself, such as hides, shell, wood, or soft stone. The Tobias site is a Great Bend aspect (ancestral Wichita) village that had dense artifact deposits, house remains and numerous deep trash-filled storage pits. It is listed in the National Register of Historic Places.